A Sampling Bee: NCircle Entertainment Movie Giveaway! Let's Go Pocoyo Playtime: Pocoyo, the unforgettable little boy with a very big personality, returns with all of his friends, Elly, Pato, Loula, Sleepy Bird, and more, in this series! Let's Go Pocoyo offers children a unique approach to learning the English language through simple, basic vocabulary. This new series of Pocoyo continues to embody the core philosophy of learning through laughter. By utilizing a blend of humor and learning, Pocoyo inspires and informs children about the world around them. Embark on eleven playtime adventures with Pocoyo and friends as they learn the importance of playtime is enjoying it with others. Enjoy playing hide and seek to playing dress up as pirates! Ahoy there, Pocoyo! Learning through laughter has never been this fun! Plus, each episode includes a refresher section in which children are reminded of key words that have been covered during Pocoyos adventures such as colors, animals, and shapes. Each episode ends with a catchy music clip reinforcing one last time those important new words. Every day is an adventure with Pocoyo and friends. Dino Dan Trek's Adventures Dino Go Seek: Join junior dinosaur expert, Trek Henderson, as he imagines dinosaurs in the real world! During an indoor game of hide and seek with his friends and Grandma, Trek discovers that Microraptors use their natural abilities to hide with the best of them! 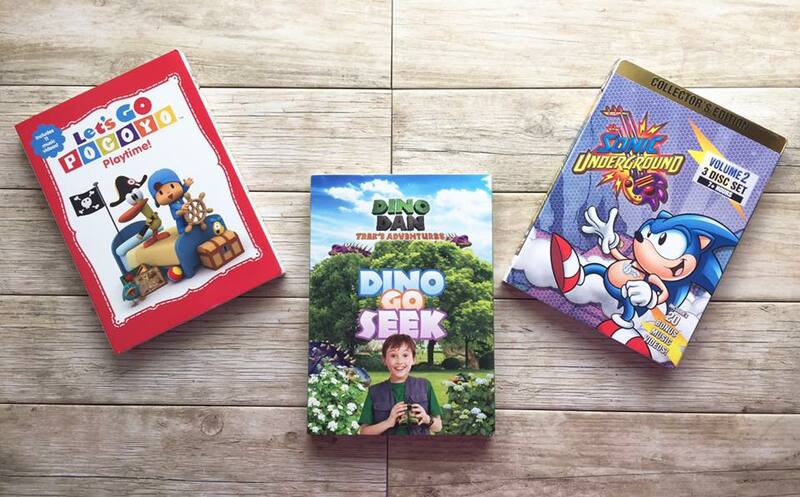 Enjoy playing dino go seek and more dino game-filled adventures with Trek and friends! Sonic Underground: Join Sonic (voiced by Family Matters' Jaleel White), and his siblings, Sonia and Manic, as they fight to be reunited with their long-lost mother, Queen Aleena. In this second and final set of episodes, we return to Dr. Robotnik having his sights set upon Queen Aleena's crown jewel, which glows as it moves closer to her. Sonic, Manic, and Sonia need to recover the jewel before Dr. Robotnik does. They need to do this not only to find their mother but also to protect her from Dr. Robotnik. Will they succeed? When they aren't battling Dr. Robotnik and his henchmen, Sonic and his siblings make time for their rock band, Sonic Underground. With over seven hours of content, this final set is sure to showcase all the best Sonic episodes from the tunes to the great battles. Based on the popular SEGA videogame character, this Sonic the Hedgehog collection is a must-have for all Sonic fans! One winner will be chosen to receive all THREE DVDs! Contest will run until May 16th! US only!